A rally held for raising mental health awareness at Kustia Islamic University on Wednesday. A daylong class camping and street march campaign on 'Mental Health Awareness' held at Islamic University (IU) in Kushtia on Wednesday. IU 'Mental Health Care Cell' organized the street march with the initiatives of the 'Law Awareness And Values Development Center' with the sloagan of ' Healthy mind gives the good life' led by the Prof Dr Reba Mandal, advisor of the organization. 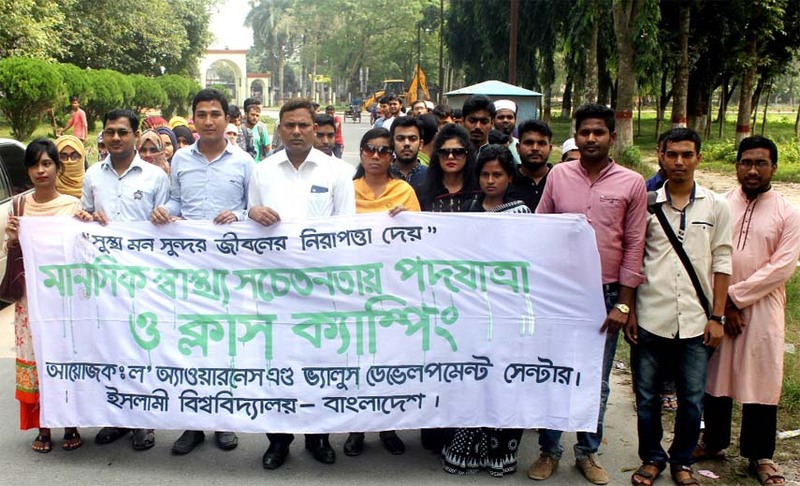 Proctor Prof Dr Mahbubo Rahman, Assistant Proctor Shammi Akter, KM Mahfujur Rahman Mishu, Vice president of the Islamic University Journalist Association (IUJA) and the other members of the organization took part into the strolling.